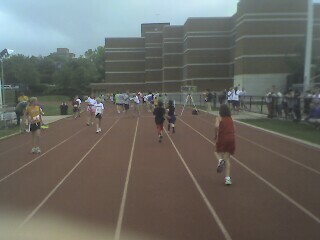 Man-Cub participated in this morning's road mile at the Univ of Tennessee, sponsored by the Knoxville Track Club. This race, on a moderately flat course near UT's Tom Black Track, featured more than 100 kids aged 3 to 15. The overall winner was a 14 year old boy who clocked a 5:34 mile, and an 8 year old boy next to us at the start had recently run a 5k in 26:19 (his mile time today: 7:19). 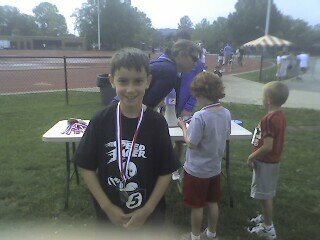 While the 8 year old competition was stiff (the photo above was Man-Cub pacing an 8 year old at the finish), our J-Man's 8:25 time - a Personal Record for the mile - was good enough for a gold medal, 1st place finish! Now we're off to a baseball scrimmage, then a friend's birthday party (appropriately at a "Speed Racer" screening), then to tonight's AA-league Smokies baseball game against Huntsville with the little league team.